Hey Daniel, I would like to ask for an advice about the following thing... Do you maybe have any tips or tricks to tune FX samples? Alex, before jumping into your question I would like to make a little detour and talk about the difference between Pitch shift and Frequency shift because this is might be the reason why you keep getting inharmonic sounds. Sound is a vibration. Note A1 wiggles 110 times per second, in other words, its fundamental frequency is 110 Herz. All other wiggles on top of the first one are called harmonics, and they are multiplied by the fundamental frequency: the frequency of the second harmonic is 220 Herz (2×110), the third — 330 Herz (3×110), the fourth — 440 (4×110), and so on. The fundamental frequency of B1 is roughly 124 Herz, and as we can see at the Spectrum analyzer, all harmonics are multiplied by this number: 124 Hz → 248 Hz → 372 Hz → 496 Hz. 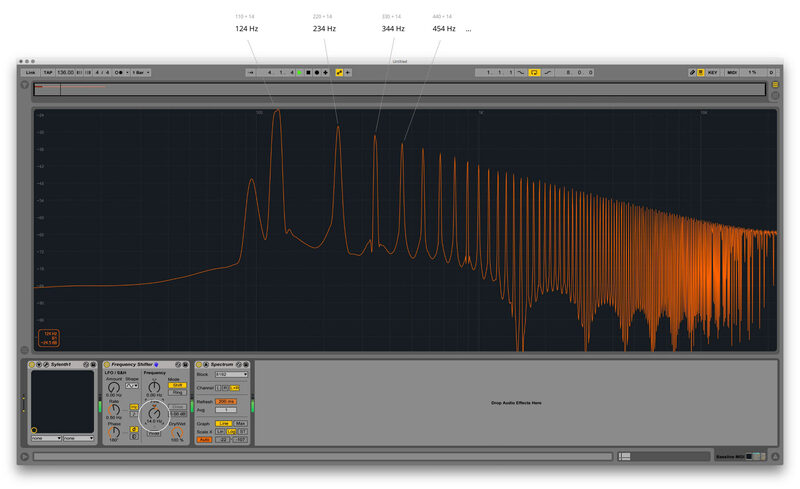 Now let’s reverse the oscillator’s transposition back to its initial position and put a Frequency shifter instead. The difference between A1 and B1 is roughly 14 Herz, so we can assume that shifting our sound at these 14 Herz will produce B1, right? Well, it’s not. This is exactly where many producers fail. Take a look at these peaks: 124 Hz → 234 Hz → 344 Hz → 454 Hz... what a mess! You see, they are no longer multiplied by the fundamental frequency, and hence, no longer sound harmonically, or musically. What Frequency shifter really does is add a constant value to each harmonics, +14 Herz in our case, producing these weird sound and graph. It literally shifts the harmonics, making it out of sync with each other. Let’s get back to your question. Now you know that in order to tune a sample and keep it sound musically, you have to transpose it using a pitch shift, not frequency shift. For example, if the sample’s note is A, and your project’s root key is F, then transpose that sample to -4 or +8 semitones. Beats Beats Mode works best for material where rhythm is dominant. 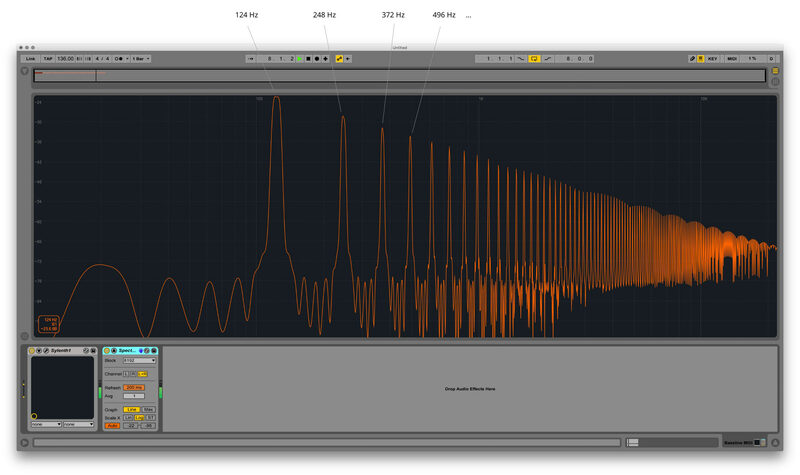 The granulation process is optimized to preserve transients in the audio material. 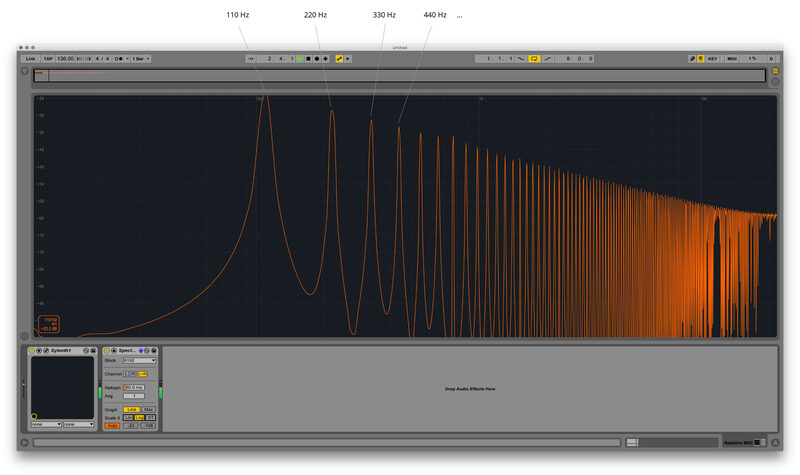 Tones Tones Mode serves well for stretching material with a more or less clear pitch structure, such as vocals, monophonic instruments and basslines. Re-Pitch This is like the “DJ stretching method‘ of using variable-speed turntables to sync two records, or what happens to samples in traditional samplers when they’re transposed. Complex Complex Mode is a warping method specifically designed to accommodate composite signals that combine the characteristics covered by other Warp Modes; it works well for warping entire songs, which usually contain beats, tones and textures. Complex Pro Complex Pro Mode uses a variation of the algorithm found in Complex mode, and may offer even better results (although with an increase in CPU usage.) 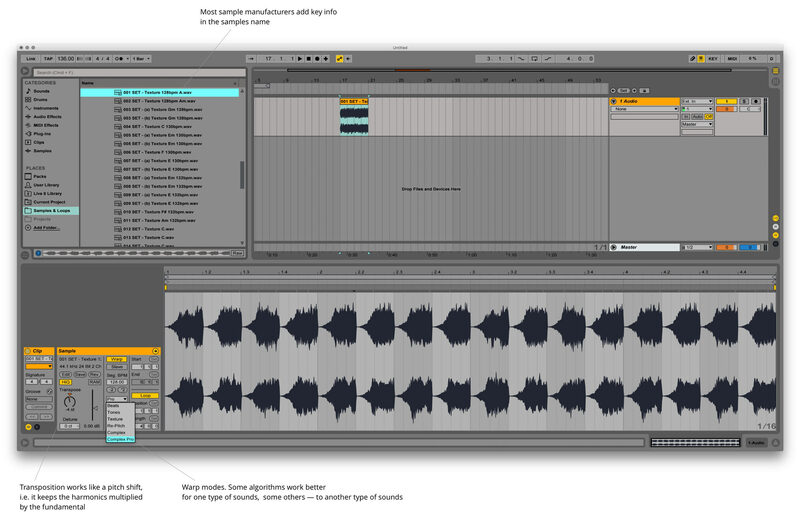 Like Complex Mode, Complex Pro works especially well with polyphonic textures or whole songs. That’s pretty much it! Make sure to choose the right warping mode and tune sample using the Transpose knob, and you’ll always get a nice harmonically tuned sample to your project. Thanks for the explanation between changes in pitch and frequency.